Eloise Stark looks under the radar. More than 1 in 100 people in the UK are estimated to have an autism spectrum condition (ASC) – a ‘triad’ of impairments related to social interaction, social communication and social imagination. Individuals also tend to have a repetitive and stereotyped pattern of activities. Around five times as many males as females are diagnosed with autism – yet the true prevalence of autism in women is believed to be a lot higher. I was diagnosed with autism aged 27, and all of a sudden my life made a lot more sense. But why did I go under the radar for so long? And are there many more women out there who don’t know that they are autistic? What distinguishes girls and women with autism from boys and men with autism? And what should we do about it? The ignorance surrounding autism in women goes back to the founding fathers of autism research. The term autism was first used by Eugen Bleuler in 1908. It stems from the Greek word autós, meaning self, and Bleuler used it to describe a patient with schizophrenia who had withdrawn into his own world. The study of autism was resurrected independently in the 1940s by two doctors, Leo Kanner in the US and Hans Asperger in Austria. While Kanner focused on children with the most obvious needs, Asperger focused upon children who appeared to be very able, and would later get the diagnosis of Asperger’s syndrome. Both doctors came into contact with girls displaying similar difficulties, and Kanner even stated in 1971 that autism seems to present differently in girls and boys. Yet neither pursued those differences between the two sexes, setting the legacy of inequality for years to come. Subsequent research focused upon boys, and considered autism to be a predominantly male condition. The diagnostic criteria were thereby based upon the presentation of autism in boys and men. Girls and women with autism went largely under the radar. More recently, the ‘extreme male brain’ theory developed by Simon Baron-Cohen has proposed that men are better at systematising and women at empathising. From this, he suggests that the male brain is more ‘autistic’ and that females with autism have ‘male’ brains. However, the theory that autistic individuals are not good at empathising has recently been challenged (Bird & Viding, 2014). For many girls and women, comparing themselves with autistic males and the archetypal ‘Rain Man’ savant, it can be difficult to see yourself as autistic too. If you’re not a boy who excels at mathematics but doesn’t understand people, you can’t possibly be autistic, right? Sarah Hendrickx, a wonderful speaker on autism in women, was herself diagnosed only in her early forties. She comments, ‘by this time, I had written six books on autism, completed a Masters degree in autism, delivered nearly 1,000 autism training/conference sessions and worked with several hundred autistic people in a professional capacity’. Thankfully, handfuls of researchers across the world have started exploring the potential for a different presentation in women, to answer the question of whether the male bias in diagnosis is a true bias. I attended a National Autistic Society conference in November 2016 on Women and Girls with Autism, and the conference venue was packed with interested autistic women and professionals. It seems like the times are a-changing, but what do we already know, and where do we go from here? Social motivation – is this the difference? During my ‘autism journey’ through the diagnostic process and to this day, I have reflected a lot on how autism differs between girls and boys, women and men. I have an autistic cousin, a man, and I always thought that I couldn’t possibly be autistic because I wasn’t like him. I came to the conclusion that as a child, even though I didn’t understand social rules or things like fashion trends, I always had a hunger for friends and social opportunities. I remember being five years old, and my previous ‘best friend’ Hannah from school had found a new best friend called Michelle. I followed the two of them around for months, not understanding how to fit in and become part of their double act. I was desperate for a ‘best friend’ and eventually my mum directed me to a wonderful little girl called Claire who I could be a best friend to. So despite my social difficulties, I had high social motivation. And I don’t believe that this is an isolated case – many of the adult women with autism that I have spoken to also tell me of their need for a social life, friends, partners and frequent meet-ups. Given this, I began to explore whether one possible difference between males and females with autism could be their social motivation. Girls with autism often crave friendships, and have a strong need to belong to a social group. Boys with autism are often content playing alone, with no overt efforts to join in social games. Research from 2016 showed that autistic girls showed similar social motivation and friendship quality to non-autistic girls, whereas boys with autism reported less motivation for social contact relative to boys without autism and girls both with and without autism (Sedgewick et al., 2016). Following on from this theory, the apparently increased social motivation in girls would presumably impact upon the development of social skills and social cognition. This could account for the fact that girls and women appear so much better at ‘camouflaging’ their social motivation – learning to fit in enables them to mimic what their peers do intuitively. The more social experience you get, the better a social creature you become. In contrast, if a male with autism doesn’t have high social motivation and a need to socialise, he won’t develop the skills as successfully because he simply won’t have as many social experiences or be as interested in them when he does. Let’s dig deeper into ‘camouflaging’ – using learnt strategies to conceal social difficulties. I developed lots of tricks to appear socially competent. I mirror the other person’s body language – if they cross their arms, so do I. I regulate my eye contact consciously – looking at my social partner and periodically looking away precisely three seconds after they do. I have modelled a lot of my social behaviour and conversational habits on my mum or other people close to me. For 27 years I thought that these rules and strategies for interacting were normal and that everyone did this, until a clinician pointed out to me that for most people, these things are intuitive and they don’t even need to think about them in social situations. It must be noted that although women often ‘camouflage’ their autism, men can too. It therefore cannot be a female phenotype: perhaps it’s explained by social motivation rather than being a lone distinguishing feature between genders. One common way for women with autism to arrive upon a diagnosis is through the mental health system. Research shows that late-diagnosed individuals often experience concurrent mental health difficulties related to the stress of constantly having to adapt to daily life in a society that demands social competency, is full of bewildering sensory experiences, and requires people to ‘fit in’ (Lai & Baron-Cohen, 2015). Whereas high social motivation in women leads to lots of social contact, this can actually be very stress-inducing and anxiety-provoking. A common misdiagnosis for autistic women is ‘emotionally unstable personality disorder’ or EUPD. One prominent symptom of EUPD is interpersonal difficulties, which evidently has a big overlap with autism as women struggle to follow social norms. Women with autism may become angry due to unexplained changes to their routine or when plans have to change. Dr Judy Eaton (2018) writes how anger in EUPD is often due to perceived abandonment resulting from early attachment difficulties. Of course, some individuals may have both autism and EUPD, but it seems from experiences I have read about that this misdiagnosis is a common one. This perhaps suggests that a lack of knowledge about how autism presents in girls and women prevents the correct diagnosis. Timely identification of the condition can mitigate problems and improve wellbeing, not to mention avoiding years of inappropriate psychological and medical treatment. For instance, knowing that you are autistic is a big shift in one’s identity. When I first found out, I felt like I was seeing life through different lenses. Parts of myself that I was very critical of, such as my inability to attend social events for long periods of time, became understandable and therefore forgivable. In addition, the constant need to camouflage is exhausting, often leaving me feeling low and emotionally drained. Now that I know that the issue of social capacity can be explained by autism, I give myself credit for lasting as long as I do in social situations, and also have the confidence to say when I need time out (which I call ‘shutdown’ and usually involves a dark room and an audiobook). I therefore believe that diagnosis is key for wellbeing. Another route for diagnosis for women is following the diagnosis of one of their children. Exploring the idiosyncrasies of autism and how it might be apparent in their offspring, they sit there and think, ‘that sounds a lot like me’. But given the great disparity in the proportions of males and females diagnosed with an ASC, and the evidence suggesting that this is a false dichotomy, it seems we might still be missing many more women who fit the criteria. How does it feel to be diagnosed as autistic later on in life? The best explanation I have heard came from Neurotribes author Steve Silberman, who said that it is like finding the Rosetta Stone to oneself. Many people say that they always knew that they weren’t ‘normal’, whatever ‘normal’ is, and finding out that they have autism is a light bulb moment. What happens next? Unfortunately, many women say that they fall through the cracks following diagnosis, as their geographic location doesn’t provide appropriate services or support systems for adults with autism. The majority of services are aimed at children, or at autistic people with the most obvious needs, such as hygiene or feeding. More needs to be done to support adults with autism, particularly those adults who appear to be swimming along serenely as a swan, but might be kicking madly underwater to stay afloat. 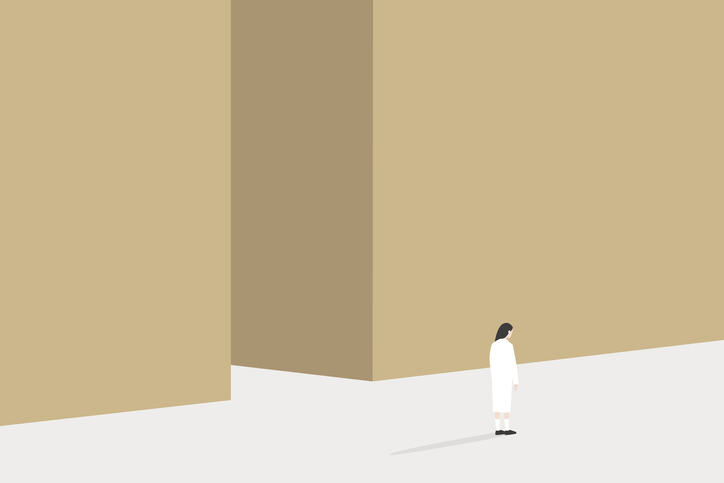 Many newly diagnosed women want to fit in, but have to learn to anticipate their difficulties, prepare accordingly and perhaps even shift expectations. For instance, my noise-cancelling headphones are a lifesaver on my daily bus rides where I struggle with auditory overload. I am still trying to overcome my instinct to get off the bus every time someone sits next to me, but getting the later bus, which is far less busy, often solves that problem. I believe that the therapeutic goal for individuals diagnosed with autism, both men and women, boys and girls, should be to educate us to bear the difficulties we experience through several means. First, understanding our strengths, such as obsessive attention to detail, can help us find careers and pasttimes where we excel. Understanding our challenges can help us to mitigate them, such as by only wearing soft cotton clothes so we don’t experience unbearable tactile sensitivity to awful inventions such as nylon. It is important to empower people to be their own hero – find our own special strategies for our own special challenges. Personally, I have also found skills such as distress tolerance, mindfulness, and cognitive behavioural therapy (CBT) to be helpful. If there are more women with autism who have gone under the radar and don’t know they have the condition, there are ethical questions. If they haven’t come to medical or psychological attention, are they functioning well enough and therefore don’t need a diagnosis? Diagnosis may signify that something is wrong, whereas for many women living with autism, they may have found their right niche and be living happily. It’s certainly an interesting question to consider. For me, the challenge shifts to understanding how we can best support both children and adults with autism who have different drives and goals. My dream is to become a clinical psychologist. Several people have told me that I could never do so due to being autistic… their perception is that I must have poor social skills. However, my social motivation has given me the practice to become just as socially competent as many adults without autism, and I no longer see this as a barrier to my chosen career. My advice for women or girls diagnosed with autism is simple. In Margaret Atwood’s The Penelopiad she writes: ‘…water always goes where it wants to go, and nothing in the end can stand against it. Water is patient. Dripping water wears away a stone. Remember that, my child. Remember you are half water. If you can’t go through an obstacle, go around it. Water does.’ This applies to the autistic female too – if you can’t go the neurotypical route, find your own. Baron-Cohen, S. (2002). The extreme male brain theory of autism. Trends in Cognitive Science, 6(6), 248–254. Bird, G. & Viding, E. (2014). The self to other model of empathy: Providing a new framework for understanding empathy impairments in psychopathy, autism, and alexithymia. Neuroscience and Biobehavioral Review, 47, 520–532. Eaton, J. (2018). A guide to mental health issues in girls and young women on the autism spectrum. London: Jessica Kingsley. Lai, M.C. & Baron-Cohen, S. (2015). Identifying the lost generation of adults with autism spectrum conditions. Lancet Psychiatry, 2(11), 1013–1027. Sedgewick, F., Hill, V., Yates, R. et al. (2016). Gender differences in the social motivation and friendship experiences of autistic and non-autistic adolescents. Journal of Autism and Developmental Disorders, 46(4), 1297–1306. Thank-you for writing this enlightening article. Sadly, for a long time whilst I was on the D.Clin.Psy course I felt unable to raise my suspicions about being autistic. I was afraid of the lack of understanding and that stereotypes would prevail - leading to misunderstanding of me as an autistic woman. I am now a Consultsnt Clinical Psychologist specialising within Autism and Mental Health. Don’t let anyone ever tell you that you “can’t”. We desperately need more autistic clinical psychologists, and for there to be acceptance of their unique attributes and talents. Please do contact me if I can offer any guidance in pursuit of your wish to become a Clinical Psychologist.